Description: Suny Fredonia guitar professor will give a two-hour workshop/presentation on different techniques to better the practicing habits of young guitarists. This workshop is designed to give guitarists a more directed approach to practicing and creating music for guitar. Description: A close friend of Dyens, James Piorkowski will shed light to an audience on the contributions this international figure has given to the Guitar world. Dyens’s contributions are some that will leave his legacy cemented. Piorkowski’s presentation will express to an audience the life, compositions, impact, and friendship of Roland Dyens on not only himself, but an entire community of guitar appreciators. Description: The Music Publisher Seconda Prattica is sponsoring an international arrangement competition surrounding the musical works of Roland Dyens where 9 scores will be selected from online submissions to the publisher. The selected scores will be performed in a live concert and awarded prizes. During the concert, the audience members will be asked to vote and the scores from the audience will be combined with judges scores to help pick the audience prize. The winners will be announced during Saturday's concert. Description: This Roundtable Forum and Symposium will be a group discussion with a mediator. The Mediator will present questions centered around the achievements of these artists specifically in the realms of arranging and composition and the impact Roland Dyens’s work has had on their careers’ and musical directions’. The last 30 minutes will be dedicated to a question and answer from the audience where attendees can address the panel with individual questions that they may have about subjects covered during the roundtable. Description: This concert is designed to showcase not only the talents of these international artists but also serves as a perfect forum to showcase the musical aspects of subjects covered in the previous roundtable. The programming for this concert will consist primarily of a wide range of arrangements from many different genres and countries i.e. Spanish, Cuban, German, French, Brazilian, and other countries. With the approval and encouragement from the family of Roland Dyens, Seconda Prattica is presenting the “Roland Dyens International Arrangement Competition for Solo Guitar” in this 2017 season. As SecondaPrattica.org continues to grow and become the preeminent online PDF-only publisher, we are pleased to once again sponsor this prestigious competition. Sadly, the world of music suffered a great loss when Maestro Dyens died in October 2016, but to keep his passion and advocacy for the art of arranging alive, his competition will continue. 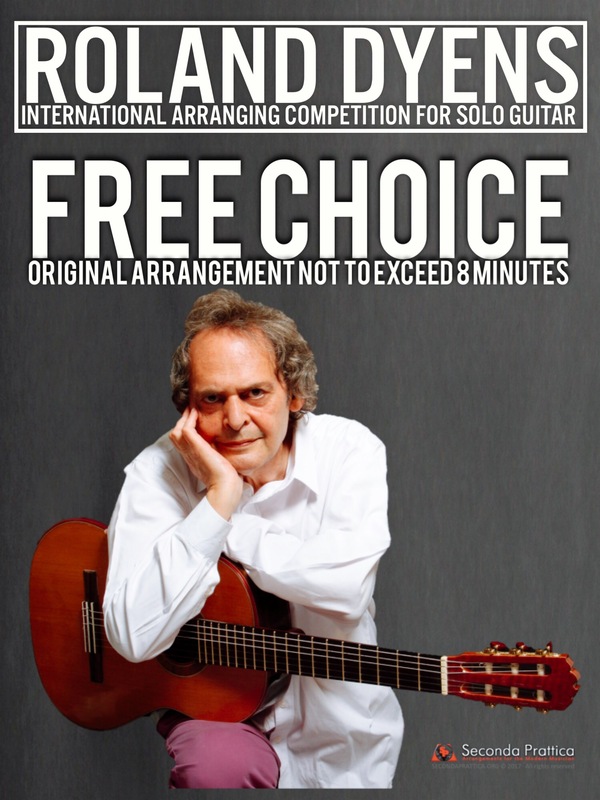 Following in the tradition of the classical and romantic eras, the objective of this competition is to inspire the creation of new arrangements for the classical guitar at the highest possible artistic levels. In the 21st century, the composer/performer most associated with the gold standard of guitar arrangements is Roland Dyens. Maestro Dyens is internationally recognized as advancing the art of arranging to the highest level the guitar has seen to date. 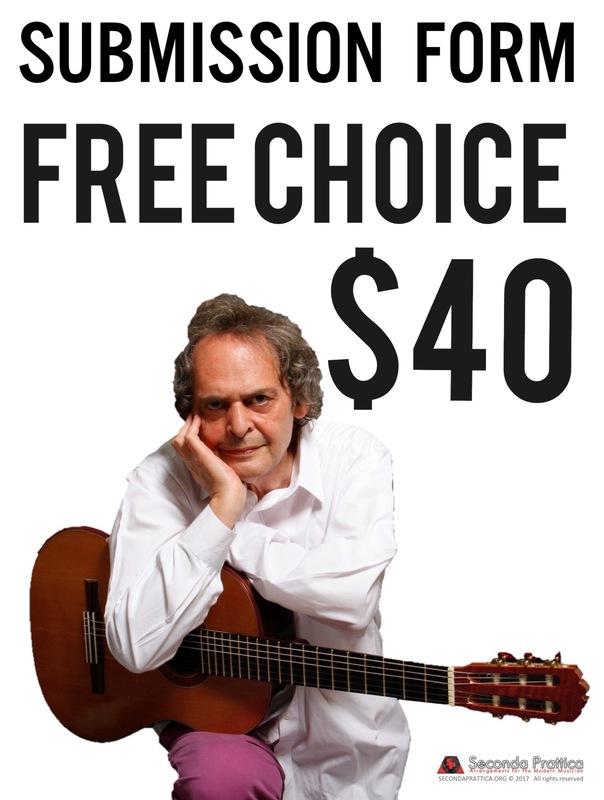 Following in the footsteps of history’s great arrangers: Francisco Tarrega, Miguel Llobet, and Emilio Pujol, Roland Dyens has had a profound impact on the guitar repertoire and had personally birthed the idea of this arrangement competition to promote and advance this vital musical genre. Our mission this year is to celebrate Roland Dyens’ life and unparalleled contributions to the guitar world and repertoire. The “Roland Dyens International Arranging Competition for Solo Guitar,” will showcase artists, arrangers, and pedagogues that have worked closely with Roland Dyens. The guidelines and judging procedures that Maestro Dyens and James Piorkowski carefully created for the initial competition in 2014 will again be implemented. 1) The work must be an original arrangement of a song or composition open to the preference of the arranger. 2) Duration of this arrangement must be no more than 8 minutes in length. 3) No hand written scores will be accepted. Your arrangement must be original and without infringement of copyright laws. 4) Submissions must be in PDF format. When your arrangement is ready for submission, click this link - Submission and fill out all required fields. This will constitute your application. 5) Audio file (.mp3) Please upload an audio file for your arrangement through the Submission form, as this will expedite the screening process. Note that we do allow MIDI audio files. 6) A $40 (USD) application fee must accompany the submission of your arrangement. Your submission will not go through until payment has been submitted. 7) You may submit more than one arrangement, with an additional $40 fee to be paid associated with each submission. 8) If your submission is awarded a prize, you must own the copyright to your arrangement in order for Seconda Prattica to publish your score. Depending on the assessed quality of the submissions, the judging panel will reserve the right to not present a particular prize (1st, 2nd or 3rd). All prize-winning works performed at the festival will be recorded (audio and video) by Buffalo State, The State University of New York. The winning pieces will be available for purchase on Seconda Prattica website. A link to recordings will be emailed to all members of the Seconda Prattica website. The scores will be divided equally into thirds and will be distributed to the judges. Numerical codes will be used instead of arrangers' names, so that the arrangers will be unknown to the judges. Each of the three judges will review the submitted scores and select nine submissions, reducing the total submissions to twenty-seven. After each judge reviews and grades all twenty-seven selected scores, the judges will meet to vote and select the final nine arrangements, which will be subsequently performed at the festival on October 13, 2017. At that time, the names of the arrangers will be revealed to the judges. The selected arrangers will then be notified by email. When the nine scores have been selected, the names of the arrangers will be posted on the SecondaPrattica.org website, but their arrangement titles will not be announced, in order to keep this information unknown to the performers of the arrangements. Judges will review scores as the arrangements are performed. The three designated artists are the only performers for the final round, with the selected scores from the preliminary review divided at random between the three performers. Due to rubrics and scoring protocols, arrangers will not be permitted to perform their own work. Winners will be announced during the intermission of the 7:30PM concert on Saturday, October 14, 2017. If you are interested in supporting the current or future Roland Dyens festival or sponsoring a prize at any level, please Contact Us . Sp.org gives 100% of the funds raised in entry fees, ticket sales, and donations to support the RDIAC Festival and Competition.